Living and working in London during the week? Looking for some late-night culture or learning? We hunt down the best galleries, classes and evening activities to keep you entertained after work. If you’re looking for good food on the go, check out The Real Food Market at the Southbank Centre, which features around 40 food and drink producers selling seasonal produce directly to the public. It is open into the evening on a Friday as well as at the weekend. Stalls include Spinach and Agusi with spicy Ghanaian stews, Cannon & Cannon’s range of wonderful salamis and hams and Curry Shack with its Caribbean and Indian curries. There’s a focus on sustainably and ethically produced food, and the market proudly supports small producers and independent traders. Prices at the market are affordable, and a hearty meal costs about £8. Forget wine o’clock; gin is back and it’s got its swagger on, says Leon Dalloway, founder of Shake, Rattle and Stir, which offers gin tours day and night to London’s finest cocktail bars to explore the spirit that has become so synonymous with the City. You’ll be chauffeur driven by gin carriage to five bars including a working gin distillery. Evening classes are a great way to explore your inner Picasso in a relaxed atmosphere. The Art Academy on Borough High Street offers a range of evening classes for all abilities, including painting, sculpture, drawing, printmaking, ceramics, glass, digital photography, Photoshop, jewellery and stone carving. One of the world’s oldest museums, the British Museum is vast and its collections comprise millions of objects. Selected galleries are open until 8.30pm every Friday evening, while occasional Late London nights have ranged from Sherlock Holmes exhibitions to Cleopatra-style makeovers. There’s no need to wait until the weekend for a quick round. Urban Golf in the heart of Soho is home to championship course simulators and greens. A cross between a bar, a driving range and a games arcade, you may be simply bashing a ball against a wall, but you can watch it soar off into the remarkably realistic screen. With cocktails at the bar, there is as much emphasis on the après-golf as the activity itself. Practice sessions with professionals are available. Whitechapel Gallery is a touchstone for contemporary art internationally. For more than a century it has premiered world-class artists from modern masters such as Pablo Picasso, Jackson Pollock, Mark Rothko and Frida Kahlo to contemporaries such as Sophie Calle, Lucian Freud, Gilbert & George and Mark Wallinger. Entry is free, it is open all year round and until 9pm on Thursdays, and you can grab a bite to eat while you’re there as the café-bar and dining room serve until 11pm. What’s better than watching a film all snuggled up in bed? Watching a film on a big screen while lounging on a bean bag, propped up by your own comfy pillow and being served drinks—that’s what the creators of the new Shoreditch (where else?) 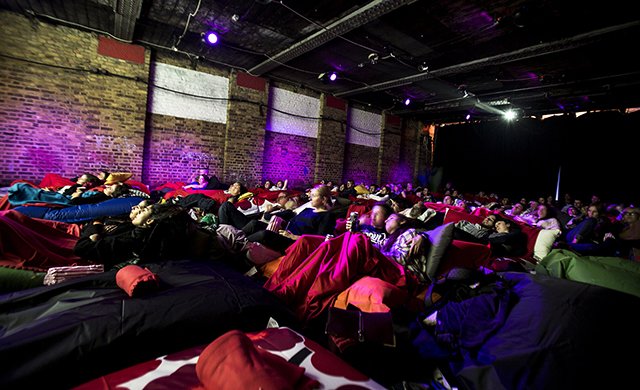 concept Pillow Cinema have decided. There is a strict BYOP (Bring Your Own Pillow) door policy and the price of a ticket is the cost of renting a big FatBoy bean bag (£20), which accommodates two. Imminent releases include Boyhood and The Grand Budapest Hotel. The Handel House Museum is the perfect place to learn about Handel’s life, music and 18th century London. Visitors can enjoy regular live music, special exhibitions and other public events. It is open until 8pm on Thursdays, with intimate classical music concerts. A predictable, but more than worthy inclusion, Tate Modern has been extraordinarily successful in bringing challenging work to the masses. The beauty of visiting after work—Friday is best because it is open until 10pm—is that although special exhibits cost £8-10, you can spend much time as you like dipping in and out of its permanent (free) collection of 60,000 works. The upstairs cafe has wonderful Thames views, and the building’s amazing. No time to exercise? Wrong: shorter, harder workouts can easily be squeezed between commute and dinner, and now that the evenings are beginning to draw out you don’t have to head to the gym. Free Fitness put on free outdoor exercise classes at various London parks including Green Park, Wandsworth Common and Clapham Common. Activities range from ‘shred and burn’ to boot club and Hiit—a high intensity, full body workout. Some classes are daytime only, but there are plenty of evening options, too. If you need a break from the relentless gallop of life in London life, there are sanctuaries to escape to for a spot of meditation. Inner Space in Covent Garden runs various free evening courses in meditation, relaxation and positive thinking. Attendance is free, but donations are welcome. Country Life suggests 12 reasons why you should wake up from hibernation and make the most of the winter months.